You only need your intrastate DOT Number if you’re planning on running one state. Check out the difference between an interstate and intrastate DOT Number to see if your trucking company may need one. The final cost of the truck can vary from anywhere between $15,000 to $175,000. The cost of insurance changes depending on insurance provider, trucker experience, miles driven, and model and year of truck. The fee for the UCR was just updated in 2018. For a fleet between 0 and 2 trucks, the new fee is $69. You can get the paperwork done for you with the help of Motor Carrier HQ for $120 if your company has 0-2 trucks, and $290 for fleets with 3-5 trucks. Each state has a different registration rate. If you’re looking to start an LLC in Utah, it will cost around $70. These are just a few starting points to start your own trucking company. 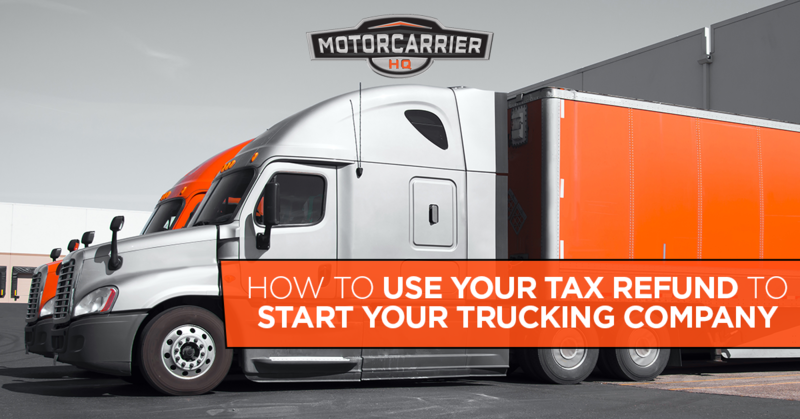 If you’re ready to get your trucking company started, give Motor Carrier HQ a call at (866) 739-2032! We can help you sort through all of the paperwork to save you time and money, so you can get on the road. If you’re planning on running under your own motor carrier authority, you will most likely need your USDOT number and MC Number. These allow your company to haul loads commercially. You can see more on how to get your USDOT Number from our video series. If you’re only planning on running your business in one state, you may need an intrastate DOT Number. This allows you to legally haul loads in the state that you applied for. Give us a call to determine whether or not you need this one. The truck you choose is one of the biggest expenses of starting a trucking company. The better the truck, you’ll likely have lower maintenance costs, but it’s a higher upfront cost. When deciding which truck to get, there are a number of choices you can make that affect the cost of your truck. You can choose to buy a used truck, which means you’ll be in it for the long-haul. Your credit score greatly affects how much a loan will cost to cover the truck. You can also choose to lease a truck. By leasing a truck, you are “renting” it under a contract. If you want to keep the truck after your contract is over, some truck leases allow you to buy the truck. There are advantages and disadvantages to each option. If you’re running your own trucking company under your own operating authority, you are required to have trucking insurance before you can even start taking on loads. Trucking insurance is expensive, so it’s important to get the right coverage. If you’re operating under your own authority, insurance will most likely be more expensive, especially if you only recently got your authority. The cost also changes based on the experience of your drivers, too. This cost is just one of the many fees if you’re running your own trucking company under your own operating authority. However, the cost of the UCR will be changing some time in 2018. This cost varies depending on the state you’re registering in and how you register your business. You can choose from a variety of business structures, such as a corporation or a sole-proprietorship. It is a necessary cost, though, as it is part of the requirements you need to get to legally run your business for a profit. Are you ready to get your trucking company started? If your tax refund is just that extra push you need to fund your company, what are you waiting for? Take the leap and get started! Motor Carrier HQ can sort through all the paperwork to save you time and money so you can become your own boss and get on the road! Give us a call today!